The swimming pool isn’t the only important feature in the pool area. The pool deck around it just as worthy of attention. No matter how pristine the pool is, a deteriorating pool deck could ruin the whole look. The chemicals in the pool that are effectively keeping the pool water free from bacteria are not that friendly on a pool deck. Over time, continuous exposure to it could break down the surface of the deck and weaken the concrete. Even salt from salt-water pools could weaken concrete pool decks and cause white, powdery stains. Here are some things you could try to minimize the damage that pool water chemicals and saltwater can cause. Sealing concrete is highly recommended by concrete experts. Concrete is highly porous so you need something that would seal the pores to prevent it from absorbing anything. There are different pool deck sealers out there. It is important that you choose the type that would best suit the type of pool you have. Salt-water pools need a special kind of sealer, one that could endure constant exposure to saltwater and salt build-up. Damage on the concrete pool deck makes it more vulnerable to stains and other damage. The crack, no matter how small, is an opportunity for water or salt to enter the slab. Once penetrated, it could wreak havoc from within the slab, causing deeper and more extensive damage. If you detect cracks, seal or fill it in immediately. If there are too many, pool deck resurfacing can help significantly. A stamped overlay can cover up minor surface damage and give the deck a newer look and a more durable surface. Just make sure to seal the overlay afterward for extra protection. 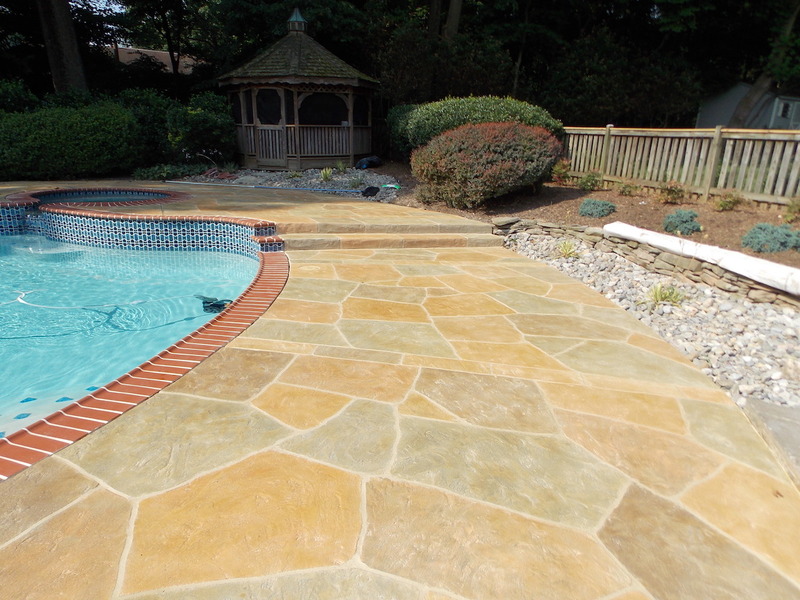 Sealers often only last a couple of years, more or less, depending on how much the pool deck is used. You don’t have to wait two years before reapplying the sealer. If you notice that the surface has gone dull, it is an indication that the sealer has faded. Make sure, though, that you use the same sealer you used before. But if you want to use another, the pool deck surface must first be sanded to remove any trace of the previous sealer used. Not doing so may cause issues.